Translucent and Textural Backdrops for Retail Design, Exhibit Design and Display Design from Studio Productions, Inc. This is a gallery of images using our products. Use one of the ARROWS at the bottom to see each photo. 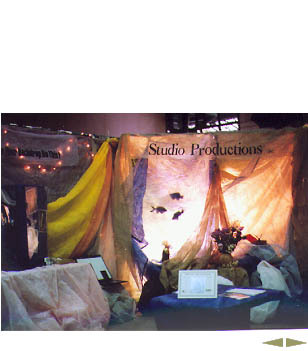 Studio Cloth on display at a trade show. Notice the translucent effect of the props behind the cloth. Also the banner is printed Chameleon Cloth. ©2004 Studio Productions, Inc. all rights reserved.